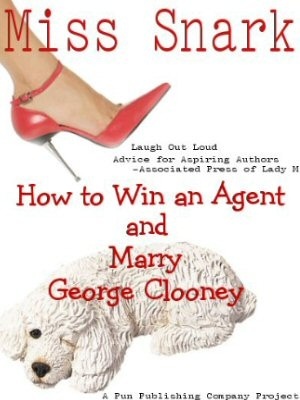 Miss Snark, the literary agent: That's a fine how do ya do! I have a question. It may be a nitwit question - just a warning. I'm finishing the final rewrite/revision of my middle grade novel, and while hemming and hawing about whether it's done, I'm beginning to research agents to query. Good, right? Even better, I found one who appears to be to looking for exactly the book I have written. Huzzah! Everything the agent has sold (which is a sizeable amount) is yet to appear in print. I've checked the agency website and Publisher's Marketplace, looked at AgentQuery and cross-checked against Amazon.com . Coming in Fall '06! Out in May '07! Plenty of that. The "hot off the presses" column? Empty. I want this agent to know I've done my homework. If I say in my query, "I'm looking forward to reading My Interesting Novel by Jane Doe," does that come off as well-informed? Or does it get my forehead stamped with "desperate stalker?" Desperate? Yes. Stalker? Not so much. ahhh...the fine line between stalking and being well prepared. 1. "You looked lovely in your pink frock today"
2. "Killer Yapp is just decorative, right? He wouldn't actually bite anyone who came to your door...would he?" 3. "I googled you and we went to the same day school. Do you remember Sister Sadistic from fifth grade?" 4. "My mother's cousin's boyfriend's car mechanic is Munch Mancini, and I notice you read her books." 5. "We live on the same block...are you that crazy girl with the poodle?" You'll notice that each of these has an element of personal contact -school, home, appearance, or is a psychotic break from reality (Munch Mancini is NOT a real person). It is entirely disquieting how much personal info is available on the web and the savvy query writer knows to avoid making an agent suspect you're a wing nut who doesn't understand that this is a business, not Friendster. That is why things like "books you've sold" are fine; attendance at the same university, or residence in the same city (even long past) can be fine; but anything that makes you look like you are lurking outside the foyer today under a mushroom waiting for the Frog Prince...that's bad. 3. Anything published by a reputable trade journal: PW, Publishers Lunch, Galleycat, MediabistroTB. 4. Anything said at a writers conference you yourself attended, or online chatforums you attended with the agent. 5. Bios in the conference programs. What's not ok is tracking down Grandmother Snark, plying her with demon rum and asking her to for the keys to Snark Central so you can find out what kind of dog food KY stocks in his remote control canine cupboard. Other than the fact that Grandmother Snark can probably drink you and your little dog too under the table...you want to avoid this kind personal connection. Avoid Google-ogle, wherein you google the agent and find every last comment ever made and from that try to establish a connection. Connection is over rated. You don't have to know much about me to query; write well enough and Miss Snark will be glad to perform introductions all around. Dear Miss Snark - do you have any tips for aspiring agrarian lilies of the field? I totally agree. And never let on that you can actually view someone through their computer. P.S. I love that shirt on you! LOLOL Miss Snark - good one! Fabulous Miss Snark, that was fun. But it made me think of a manuscript request I got when I began my query with something like: "I pass your office every day, but have never seen you outside, so I guess you don't smoke." Well, I guess he liked that bit of humor, cause he asked for the manuscript. We know someone in common, though, and I wouldn't usually say something like this. It was fun to try it once - and it worked!